This article explains how to perform basic compass calibration. This article assumes that you are using the most common configuration — a flight controller and compass mounted with the arrow on each facing toward the front of the vehicle. If you’re using a different configuration see Advanced Compass Setup. It’s often better to do this test with the vehicle’s motor running, to ensure that any magnetic interference from the motor is included in the compass calibration. Under Initial Setup | Mandatory Hardware select Compass. For any modern flight controller (Pixhawk, NAVIO2, etc) select the button Pixhawk/PX4. You normally shouldn’t need to change any of the “General Compass Settings” or compass specific values (i.e. “Compass #1” section), but you might want to confirm that the Enable compasses and Obtain declination automatically boxes are checked. You may wish to disable Compass #2 (the internal compass) if you are seeing the dreaded “inconsistent compasses” pre-arm message often and you are sure that the external compass’s orientation is correct. 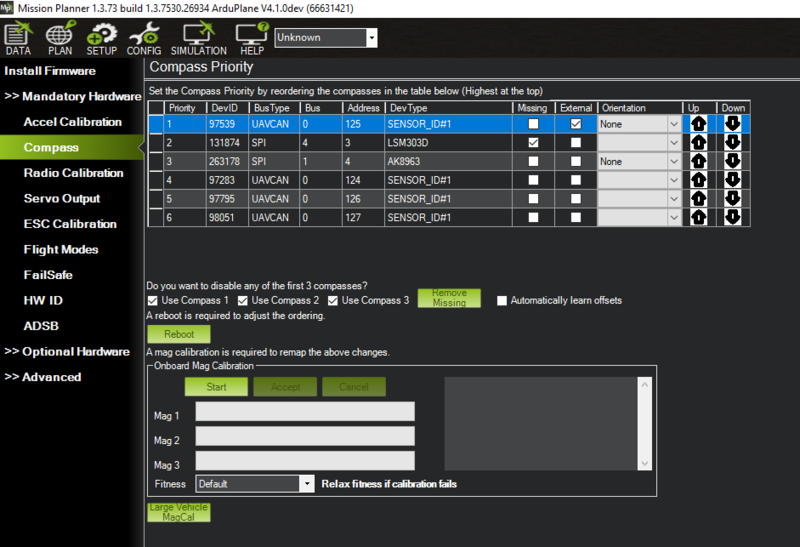 Copter-3.4 (and higher) supports “Onboard Calibration” meaning that the calibration routine runs on the flight controller. This method is more accurate than the older “Offboard Calibration” (aka “Live Calibration”) which runs on the ground station because in addition to offsets, scaling is also calculated. upon successful completion three rising tones will be emitted and a “Please reboot the autopilot” window will appear and you will need to reboot the autopilot before it is possible to arm the vehicle. if, after multiple attempts, you are unable to calibrate the compass, Press the “Cancel” button and change the “Fitness” drop-down to a more relaxed setting and try again. Copter-3.4 (and higher) supports “Onboard Calibration using RC Controller stick gestures” meaning that the calibration routine runs on the flight controller with no GCS. This method is more accurate than the older “Offboard Calibration” (aka “Live Calibration”) which runs on the ground station because in addition to offsets, scaling is also calculated. upon successful completion three rising tones will be emitted and you will need to reboot the autopilot before it is possible to arm the vehicle. A window should pop-up showing you the state of the live calibration. The aim is to rotate the vehicle so that the coloured trail hits each of the white dots. One way to do this is to hold the vehicle in the air and rotate it slowly so that each side (front, back, left, right, top and bottom) points down towards the earth for a few seconds in turn. More information about compass configuration can be found in Advanced Compass Setup. This includes instructions for how to set up additional compasses, non-standard compass alignments, compassmot, etc. General discussion on magnetic interference and ways to reduce it can be found in Magnetic Interference. Video demonstrations of compass calibration.